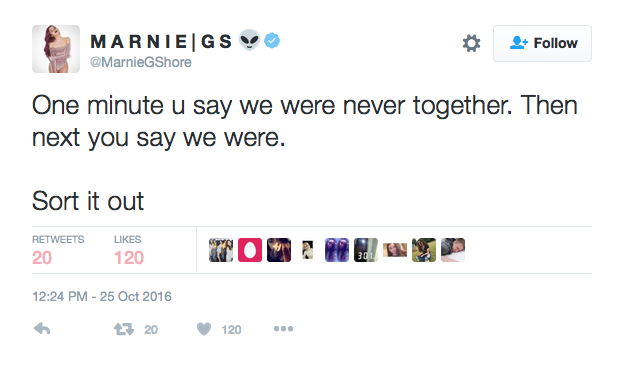 Marnie's pullng no punches with these exes! If there’s one thing to be learned from Marnie Simpson‘s recent social media output, its that her ex-boyfriends better watch their backs – whether they see themselves as such or not. Hours after hitting out at former fiancé, TOWIE alumnus Ricky Rayment, Marnie has struck again, with her co-star and previous flirting partner Aaron Chalmers, after he criticises her for moving on with Lewis Bloor…weeks after claiming they were never a couple in the first place! In preparation for the new series of Geordie Shore, Marnie spoke out about her now-finished relationship with her castmate, Aaron. 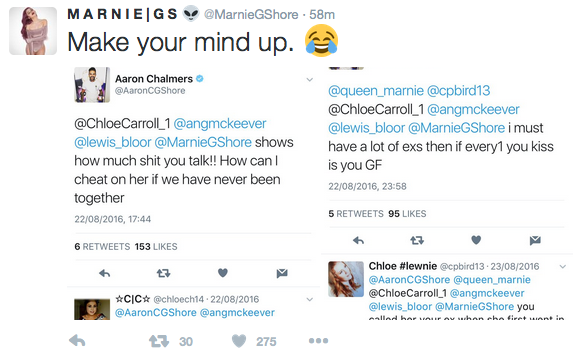 Unfortunately for Aaron, however, Marnie was prepared to fight her corner by exposing his contradicting words – according to Aaron, back in August, he and Marnie were never together! Writing to some viewers during the summer run of Celebrity Big Brother, he said: ‘I must have a lot of exs then if every1 you kiss is you GF’ and ‘shows how much sh*t you talk!! How can I cheat on her if we have never been together’. ‘One minute u say we were never together. Then next you say we were.